Initially the purpose of the kitchen backsplash was purely functional: A tiled area behind the stove and sink to protect kitchen walls from stains and splashes. Today the availability of many types of kitchen backsplash materials in a wide range of finishes makes the dashboard fulfill several functions; the dashboard not only serves to protect your walls, but also adds color, shape and texture. Find out how to choose the perfect kitchen backsplash according to the most suitable material for your kitchen. Choosing a backsplash of stainless steel can be for you if you want to give an industrial touch to the kitchen. With its sterile finish but elegant style, stainless steel seems an intelligent, versatile and very modern choice. It also allows to easily match all stainless steel appliances together, which can prove to be quite difficult to do in other styles. The material comes in flat steel sheets that fix directly to the wall, either with glue or screws. To clean, you should always use warm water and a cloth. Otherwise, the chemicals in common cleaning products can make watermarks and fingerprints look more prominent. PROS: Stainless steel is not only affordable; it is known for its durability and its resistance against heat. Besides, it is easy to clean. CONS: Although easy to clean, a stainless steel backsplash can be difficult to continue looking as it was at first. It is not scratch resistant and it can dent. TIP: Use our Real-Time Kitchen Remodeling Calculator and Find Out in Minutes How Much Your Remodel Will Cost. Tiles are a popular choice because they offer versatility, practicality and style. Thanks to advances in printing technology, ceramics and porcelain can be produced to look like wood and natural stone, but with none of the problems of performance associated to them. The tiles are resistant to scratches, heat and water, and are usually reasonably inexpensive and easy to install. They are durable, and if a tile splinters or damages, you may just remove it and put another. PROS: While tiles are easier to clean than most of other materials, and therefore become a perfect option for a backsplash, this is not the only reason why they are ideal for the job. With a wide range of shapes, sizes, colors and patterns available now, the tiles give you the freedom to put your own creative mark in your kitchen without compromising functionality. CONS: The large variety of styles and finishes can be overwhelming so you should consider exactly how the space will be used to ensure that your choice works with your lifestyle: while white tiles can look perfect for a modern kitchen, they are not the most practical choice for a busy family space. In such case, tiles in darker colors are something worth exploring. For those who want a streamlined appearance and a stylish kitchen, glass backsplash is a popular choice because it can be mounted on large panels, seamless. You should always ask for tempered glass, which is harder than ordinary glass. Also ask for polished edges, so there is less chance of scratching anything during installation. The beauty of a rear wall of glass is that you can for example choose a work of art and place it on the back of the glass, or get a glass with a printed image or a painted finish. PROS: Strong and durable, glass is also easy to clean and install. The glass backsplashes have been characterized for being expensive; the good news is that prices have fallen dramatically in recent years. CONS: Make sure you and your family choose well the background or the color behind the glass. Changing this after installation is not impossible, but it is not an easy job. A glass mirror backsplash fits all styles of kitchen. Its reflective surface bounces light around, making the space seem bright and many times larger than it really is. Note that general safety regulations dictate that you must use toughened or tempered glass. PROS: Toughened glass mirror is strong, durable and easy to clean. And because the panels are available in lengths up to 10 feet, you can create a uniform appearance. CONS: Mirror cannot be used behind a gas stove due to the continuous expansion and contraction of tempered glass created by the flame which can, over time, cause visible cracks in the glass. Although easy to clean, glass mirror needs regular polishing, as the marks are easily visible. This is a composite material made of crushed stone bound together by an adhesive. Two common stones used to produce the composite are marble and quartz, and they are usually mixed with resin. The high performance composite stone are heat resistant and extremely difficult to be scratched. PROS: composite stone is durable, scratch-resistant and non-porous, which means that it will not stain. It is easily cleaned with soap and warm water and comes in a wide range of different colors to suit all tastes. CONS: Installation of a composite stone must be performed by a specialist. Granite is still one of the favorite materials to use on the kitchen backsplash; it looks good in both traditional and contemporary settings. Two slabs of natural granite stone will never be exactly the same, which ensures a unique appearance. One of the main factors that will determine the look of your granite is whether you choose polished granite or matte. The shiny polished granite is popular for traditional and rustic kitchens. Matte granite provides much more texture, so it is the ideal choice for a contemporary kitchen. PROS: Granite is easy to clean, very durable and available in a range of different colors. CONS: Granite is porous, so it needs to be sealed to prevent stains. There’s nothing like the natural beauty of a marble backsplash, which never fails to bring a luxurious look into the kitchen. 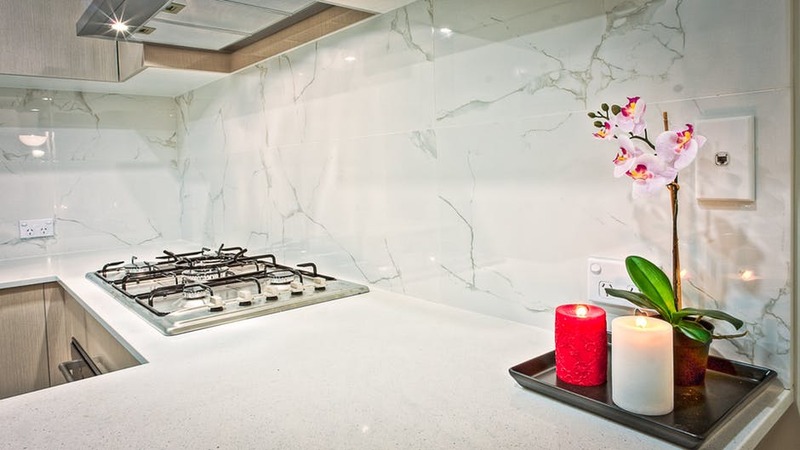 Flipping through the pages of kitchen designs you’ll notice that marble has become one of the most popular materials for the kitchen finishing; it is used everywhere, even in countertops and wall coverings. It is important to be aware, however, that marble is porous, so it needs periodic sealing and resealing to prevent staining. It also scratches more easily than other materials. PROS: Marble plates are like natural works of art, because there are not two slabs exactly alike. CONS: The cost can be a problem, depending on the source of marble. Marble can stain easily. It is beautiful, but needs maintenance. However, the marble has a lot of wonderful stripes and patterns that tend to help hide stains areas. Often, old houses and apartments treasure plastered and painted sturdy bricks behind their walls; left in sight, bricks create environments of enormous strength. Without abusing of these surfaces, it is a good idea to reinforce certain points of attention, like the rear of the worktop in the kitchen to achieve a very contemporary and industrial image. PROS: If money is a problem, the brick can be a good alternative to stone. Of course, it will look less expensive, but there is a certain charm in it. Also, if you ever dreamed of living in a loft, this is a good way to bring the style into your home. CONS: You have to remember that brick is a piece of clay, whatever form of manufacture it came from, son it can release dust. If it is an original brick wall, you have to varnish it with a product like a clear matt lacquer, which closes the pores and does not alter the aesthetics. This gives some brightness and intensity to the original color without varying it much. The other way to use it is by painting it white. The texture of the brick is kept but its original reddish appearance is changed obviously with the paint. There are many reasons to choose a backsplash of polished plaster; one is that it can be found in almost every color. As for texture, it can vary from very polished and smooth to rough and worn. PROS: It is easy to maintain and need minimal care once installed – simply rub downwards. CONS: Although polished plaster is quite sturdy, accidental damages cannot be repaired. 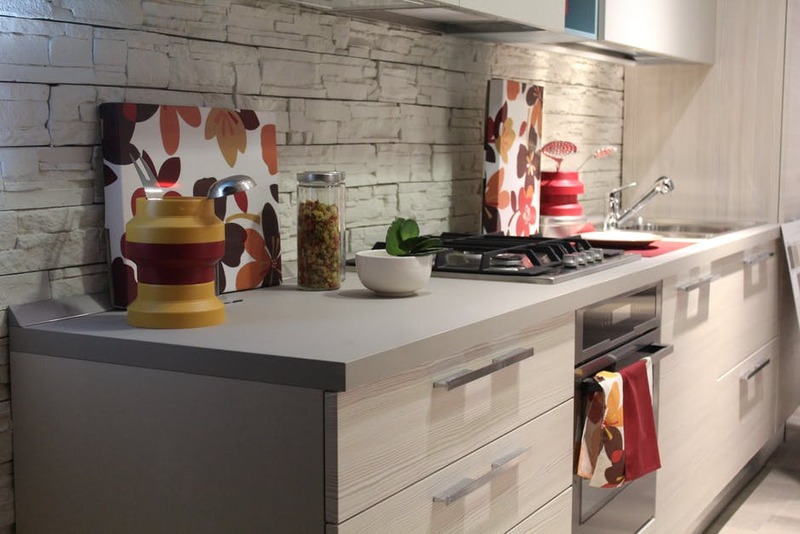 One of the kitchen backsplash ideas on a budget is to consider choosing laminates. They are not only affordable, but also available in many colors and finishes designed to look like real wood or stone. Although laminates do not offer the same sense of luxury, high-definition printing and innovations in textures are making them look and feel increasingly realistic. PROS: Easy to keep clean and waterproof, laminate is a durable and affordable option for the kitchen backsplash. CONS: the laminate is not suitable for use behind a gas stove because of the flames, and it is recommended to keep a space of at least 4 inches between a laminate and any other type of stove. You also need to make sure it is properly installed, especially around wet areas to prevent water soak joints. A kitchen backsplash should be the unifying element of your cabinets, but also can become a stunning focal point to your kitchen. So as you could see above, the selection of material is an important part in the styling of the kitchen. Finally, we give you an extra idea. Although it is difficult to implement in most homes, a strip of window on the back wall of a kitchen is great. It opens onto the landscape outside your kitchen obtaining a practical opening to quickly release fumes and odors from the area. My husband and I want to remodel our kitchen, and your article had some great tips to help us choose a backsplash for this. I liked how you said to consider glass tiles, as these backsplashes are strong, durable, and easy to install and clean. Thanks; we’ll keep this in m ind when choosing a kitchen backsplash.